Puffed-up claims from the wind-power lobby. And some opponents. The wind-power lobby is spinning the facts in a $1.4-million TV ad campaign aimed at extending a lucrative tax break worth billions to the industry. Its ads claim that Congress is “threatening new taxes” targeting wind power, which isn’t true. No “new taxes” are envisioned. Instead, Congress is considering whether or not to renew an existing $1.3-billion-a-year tax break that expires at the end of 2012. The industry is also claiming that wind energy is “on track” to support half a million new jobs within 20 years. Maybe so. But those jobs “would displace jobs and economic activity elsewhere,” according to the very study cited by the wind lobby. The debate over the tax break couldn’t be coming at a worse time for the wind-power industry. Falling natural gas prices are already bringing stiff competition from gas-fired electric plants, making some wind-power projects economically uncompetitive even with the advantage of a tax subsidy. And although there is some bipartisan support for extending the tax break for wind power, several Republican lawmakers, including Rep. Paul Ryan, are pushing to repeal all existing tax breaks for “renewable” energy sources — including the credit for wind power. But the Crossroads ads also strain the facts. For example, they cite an inflated figure for the Obama administration’s loan guarantees and grants to “clean energy” firms owned by Obama campaign backers. The figure came from a conservative author, but Crossroads misleadingly attributes it to a respected news magazine. Note: This is the first in an occasional series of stories on deceptive advertising campaigns by lobbying groups. The American Wind Energy Association’s ad, titled “Weld by Weld,” has been running in 11 states at an estimated cost of $1.4 million so far, according to Kantar Media’s Campaign Media Analysis Group. Variations of the ad target specific Republican House members with the anti-tax, pro-jobs message. Announcer: Piece by piece. Weld by weld. American manufacturing jobs are coming back. With tens of thousands of new jobs from wind energy. But now, these jobs could vanish. Congress is threatening new taxes, targeting the wind power industry; crippling an American manufacturing success story, and sending our jobs to foreign countries. A bipartisan team is fighting to save American wind power jobs. Log on. Join us. Fight for American jobs. Despite the claim of the AWEA, Congress is not “threatening new taxes” against wind energy. Congress is considering H.R. 3307, which would extend tax credits for energy production from a variety of renewable energy sources, but most immediately for wind power. This tax credit, first enacted in 1992, offers a tax rebate of 2.2 cents for each kilowatt-hour of energy produced for the first 10 years of electricity production from utility-scale turbines powered by renewable sources. Wind farms put into service after the end of 2012 won’t qualify for the credit under existing law. H.R. 3307 would extend that deadline by four years. The tax credit is a multibillion-dollar prize for the industry. The nonpartisan Joint Committee on Taxation projects that it will reduce federal revenue by $1.3 billion in the current fiscal year, $1.4 billion in fiscal 2013 and $1.5 billion the following year. Losing this benefit for future wind farms almost certainly would hurt the industry’s business. According to the Union of Concerned Scientists — which backs federal support for renewable energy — the credit has been allowed to expire for a while on three occasions in the past, followed in each case by a sharp drop in installation of new generating capacity. “This ‘on-again/off-again’ status contributes to a boom-bust cycle of development that plagues the wind industry,” the UCS states. This time the industry faces stiff opposition from many free-market conservatives. A bill by Republican Rep. Mike Pompeo of Kansas would repeal all such energy tax credits — including the one for wind power. That bill now carries the names of 18 additional cosponsors, all Republicans, including Budget Committee Chairman Paul Ryan of Wisconsin. The repeal also has the support of the anti-tax Americans for Tax Reform and several other conservative groups. Support for extending the credits is bipartisan, but leans heavily Democratic. The legislation is sponsored by Republican Rep. Dave Reichert of Washington state, but only 15 of the 64 additional cosponsors are Republican. So the wind lobby is scrambling to pick up additional GOP support with its “new taxes” pitch. Similar 15-second versions began running earlier in the districts of freshmen GOP Reps. Lou Barletta of Pennsylvania and Bobby Schilling of Illinois (a Tea Party favorite). In all, according to CMAG, the main 30-second ad or shorter versions have run in 11 states — Arkansas, California, Colorado, Iowa, Illinois, Nebraska, Nevada, Ohio, Pennsylvania, South Dakota and West Virginia. The wind lobby is also making puffed-up claims about jobs, based on a 2008 study that the industry itself helped put together. It focuses only on potential winners — and ignores the potential losers. The claim appears on the AWEA’s website (to which viewers of its TV ads are directed) and also popped up Feb. 8 in a print ad that ran in the newspaper Politico, which is widely read in Washington and on Capitol Hill. But that figure is exaggerated, in a number of ways. Most important, it is a projection only of jobs directly and indirectly supported by a vastly expanded wind industry — without accounting for the many jobs that would be lost in other industries, such as the mining and transportation of coal and the production of natural gas. The half-million estimate comes from a 2008 report issued by the Department of Energy, and it was never intended to be an official prediction. It was, to quote the report, a “scenario” produced in a “joint effort with industry” (including the AWEA), asking whether it would be “feasible” for 20 percent of U.S. electricity to come from wind power by the year 2030. That would be a huge increase. Wind power supplied less than 3 percent of the nation’s electricity in the most recent 12 months on record, according to a report issued in January by the U.S. Energy Information Administration, even after several years of rapid growth fueled by the tax credit and by funds from the Obama administration’s 2009 stimulus bill. The 2008 report concluded that the 20 percent goal was “ambitious” but “could be feasible” if “significant challenges” could be overcome. And in that case, the report said, “the wind industry could support 500,000 jobs” in the years after 2020. (See page 209, figure C7.) Only 150,000 of those would be “direct jobs” such as construction or operation of wind farms, and the rest would be from presumed “ripple effect” jobs in other industries. But even assuming the “optimistic” prediction turns out to be accurate, it doesn’t mean that anywhere near 500,000 jobs would be added to the U.S. economy. As the study itself said, rapid growth in wind-power jobs will come at the expense of other jobs. Energy Department Study, July 2008: Ramping up wind capacity and electricity output from wind would displace jobs and economic activity elsewhere. However, identifying such transfers accurately would be very difficult. Therefore, the impacts cited here do not constitute impacts to the U.S. economy overall but are specific to the wind industry and related industries. Those job costs could be significant. The AWEA’s website contains a one-page summary of the study, saying that if wind power expands to supply 20 percent of U.S. electricity, that would displace about half the natural gas used to generate electric power, amounting to 11 percent of all natural gas used across all industries. Coal consumption would be affected even more dramatically, reduced by 18 percent. The report didn’t attempt to estimate the direct and “ripple effect” job losses in those industries. Meanwhile, conservative opponents of federal help for renewable energy are engaging in some spin of their own. Pompeo, for example, says his bill, H.R. 3308, will repeal “all energy tax credits.” In an op-ed piece he co-authored after he introduced the bill, he said: “It is equal opportunity – not one single solitary tax credit would survive this bill.” But that’s not the whole story. He’d repeal all “credits,” maybe, but not all energy tax breaks. He would still leave intact some long-standing tax preferences for the oil and gas industries, including the expensing of exploration and development costs, the depletion allowance, and amortization of geological expenses. Those three are worth a total of $1.8 billion to the oil and gas industries this year alone, according to the Joint Committee on Taxation (page 34). So when Pompeo writes that he’d “do away with energy subsidies once and for all,” he doesn’t include some valuable breaks that benefit the “drill, baby, drill” crowd. Meanwhile, the Obama administration’s Solyndra scandal is encouraging partisan attacks on “green” energy subsidies in general. A new ad from Crossroads GPS claims that President Barack Obama’s administration awarded “billions” to clean energy companies that backed his 2008 campaign, which is true enough. But the ad deceptively attributes some dollar figures to Newsweek, when, in fact, they come from a conservative author’s book. Newsweek ran an excerpt. 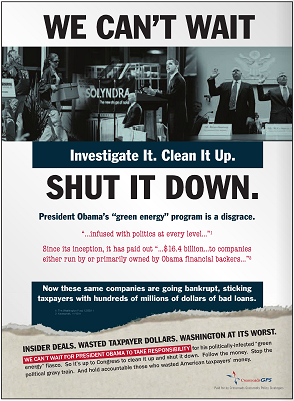 This is the second ad from the Republican-leaning Crossroads GPS attacking Obama for his involvement with Solyndra — the now-bankrupt solar company that got a $535 million loan guarantee from the Department of Energy. This one is titled “Every Level” and is backed by a $500,000 buy on national cable TV. Narrator: Then he gave his political backers billions, a big government fiasco, infused with politics at every level. $500 million to Solyndra, now bankrupt. Nearly $100 million to a pet project teetering on default. Laid off workers forgotten. Typical Washington. 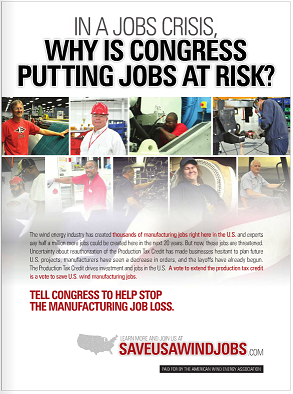 Tell President Obama we need jobs, not more insider deals. Crossroads GPS is responsible for the content of this advertisement. Central to both ads is a claim that Obama gave “$16.4 billion … to companies either run by or primarily owned by Obama financial backers.” But we find that figure is both inflated and from a partisan source that Crossroads obscures with deceptive attribution. The ad cites Newsweek as the source of the figure, but the magazine was just publishing an excerpt from the book “Throw Them All Out,” by conservative writer Peter Schweizer. A former foreign policy adviser for Sarah Palin and speech-writing consultant for the George W. Bush administration, Schweizer is now a fellow at the conservative Hoover Institution. In checking Schweizer’s $16.4 billion claim, we found it to be too high by nearly $6 billion. In his book, Schweizer lists 25 companies he says were headed by “Obama bundlers, large donors and supporters” who he said received a total of $16.4 billion in loan guarantees. Schweizer says in his book that all of that came from the Department of Energy’s 1705 program (which awarded stimulus dollars for renewable energy systems, electric power transmission systems and leading-edge biofuels projects). But by our count, only seven of the 25 companies on Schweizer’s list got 1705 loan guarantees. And they totaled about $3.7 billion, not $16.4 billion. We did find that some companies on Schweizer’s list got aid from other federal clean-energy programs, but not enough to total $16.4 billion. For example, two firms got DOE loan guarantees through the Advanced Technology Vehicles Manufacturing (ATVM) Loan Program. But those companies — Fisker Automotive and Tesla Motors — secured less than $1 billion. In all, the Department of Energy reported clean energy loans of only about $4.7 billion to firms on Schweizer’s list. Some others on the list got loans or grants through other programs with the Department of Agriculture and Treasury Department. There are other problems as well. Four of the companies on Schweizer’s list received conditional commitments for loan guarantees but never ultimately got the money (either because they were unable to provide necessary documentation in time to meet application deadlines, or because they decided to seek private, commercial financing). Schweizer told us he included them because “that doesn’t undermine the point that political connections helped at the federal level.” That may be, but the ad claims the companies received the money, and they did not. Schweizer also claimed Summit Texas Clean Energy got $1.5 billion in federal aid, which isn’t so. In fact, the Department of Energy provided the company $450 million in grants, for a $1.7 billion project financed mostly by industry. Together, those factors inflated Schweizer’s figure by nearly $6 billion. We asked Schweizer about the problems with his figures. He responded via email: “There are other companies besides those mentioned in the book that got money. It’s not presented as a complete list.” But he did not supply the “complete list” for us to validate. One more thing: Some of those listed as Obama backers also gave substantial sums to Republicans. There’s a criminal investigation under way of Solyndra’s executives, and Republican-led House investigators are still on the case. So new revelations could emerge in the future. But so far what’s been documented is evidence of questionable business judgments or wishful thinking about the economic viability of solar energy, not of any outright payola or quid pro quo. A final comment: The sort of exaggerated claims we document here, on both sides, have been common fare in Washington lobbying battles for decades. And in recent years, these deceptive tactics have increasingly spilled out in advertising aimed at the public, in the hope that constituents will be persuaded to pressure their senators and representatives to vote the way the special interests want. 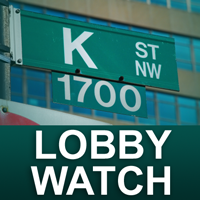 So we are launching with this piece a new “Lobby Watch” series. We’ll follow up with other articles as the occasion warrants. The Library of Congress. “Bill Text, 112th Congress (2011-2012) H.R.3307.” Accessed 8 Feb 2012. U.S. Congress, Joint Committee on Taxation. “Estimates of Federal Tax Expenditures for Fiscal Years 2011-2015.” 17 Jan 2012. Union of Concerned Scientists. “Production Tax Credit for Renewable Energy.” 13 Sep 2011. Govtrack.us. “H.R. 3308: Energy Freedom and Economic Prosperity Act.” Accessed 8 Feb 2012. U.S. Department of Energy. “20% Wind Energy by 2030; Increasing Wind Energy’s Contribution to U.S. Electric Supply.” July 2008. Johnson, Julie and Mark Chedia. “Electricity Declines 50% as Shale Spurs Natural Gas Glut: Energy.” Bloomberg News. 17 Jan 2012. Rep. Pompeo, Mike and Rep.Raul R. Labrador. “Era of energy subsidies is over: American consumers, not Congress, should choose best power sources.” The Washington Times. 26 Nov 2011. U.S. Department of Energy, Loan Programs Office. “Solyndra, Inc.” Accessed 8 Feb 2012. Crossroads GPS. “Crossroads GPS Launches New TV Ad on Solyndra Fiasco,” press release. 1 Feb 2012. Schweizer, Peter. “Obama Campaign Backers and Bundlers Rewarded With Green Grants and Loans.” 12 Nov 2011. Vogel, Peter. “Sarah Palin PAC fundraising craters.” Politico. 31 Jan 2012. U.S. Department of Energy, Loan Programs Office. “Our Projects.” Accessed 8 Feb 2012. U.S. Department of Energy, Office of NEPA Policy and Compliance. “EIS-0444: Texas Clean Energy Project (TCEP), Ector County, Texas.” Final Environmental Impact Statement. 5 Aug 2011. Restuccia, Andrew. “First Solar CEO steps down.” The Hill. 25 Oct 2011. Stephens, Joe and Carol D. Leonnig. “Solyndra: Politics infused Obama energy programs.” Washington Post. 25 Dec 2011. Restuccia, Andrew and Ben Geman, “White House sends GOP another batch of Solyndra documents.” The Hill. 13 Jan 2012. Woody, Todd. “Why A Solar Developer Turned Down $2.1 Billion From The Government.” Forbes. 18 Aug 2011. Department of Energy. Press release: DOE Offers $2.1 Billion Conditional Commitment Loan Guarantee, Support Solar Thermal Power. 18 Apr 2011. Martin, Christopher. “SolarCity Loan Guarantee Rejected by U.S. in Wake of Solyndra’s Bankruptcy.” Bloomberg News. 24 Sep 2011. Department of Energy. “Obama Administration Offers $59 Million in Conditional Loan Guarantees to Beacon Power and Nordic Windpower, Inc.” 02 Jul 2009. Department of Energy. Secretary Chu Announces Two New Projects to Reduce Emissions from Coal Plants. 01 Jul 2009.